No matter where you’re headed this camping season, there are amazing places in each of the 50 states. Check out this list of the best campsites all across the United States so you don’t miss an incredible campground! It’s time to go camping! No matter where you’re headed this camping season, there are places to camp all around the country. Each state has something beautiful to offer. Between backcountry campgrounds and unique resorts, you’ll find something unique all across the country. 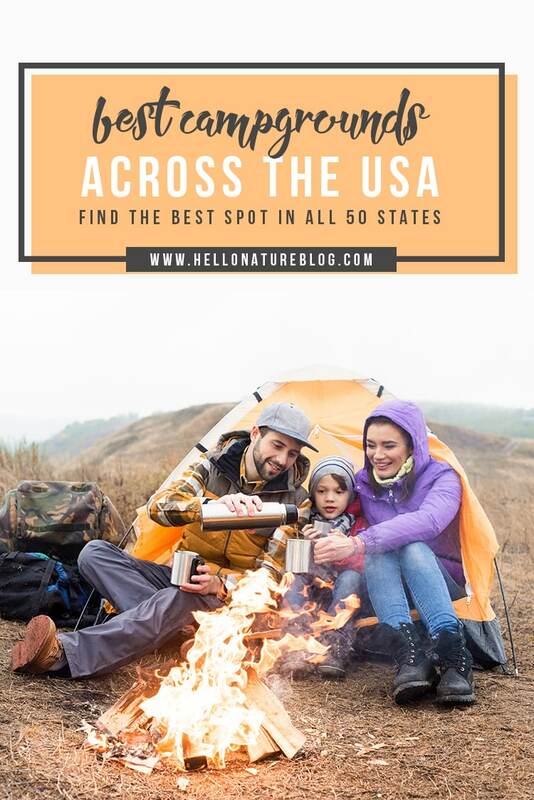 So if you’re headed out for a cross country trek or maybe just looking for a new places to camp near your home, you won’t want to miss the best places to camp in each state! Dauphin Island, AL is the perfect place for beachfront camping, bird watching, and family fun! Camping in the Yukon will allow you to experience true Alaska beauty. Free public use cabins are available along the river on a first come, first serve basis. Camp in developed areas or go backpacking and stay within the Grand Canyon. There’s something for everyone in this wondrous national treasure. This Hot Springs Arkansas area is a beautiful place to experience nature in the forest that covers 1.8 million acres in Arkansas and Oklahoma. Located on the Central California coast, Pismo Beach is the perfect place to camp with your (leashed) pets near the water. If you’ve thought about camping in the mountains, this is your stop. Enjoy the scenic drive on Trail Ridge Road before arriving at your destination. Enjoy this Connecticut coastline park with lots of water activities and walking trails. This park is popular for RV camping with lots of amenities including swimming pools and fishing. It’s just a short drive from Ocean City, Maryland. Disney campgrounds are surprisingly affordable and so much fun! This cooler climate is perfect for camping amidst the Blue Ridge Mountains. The views are the best in Georgia. See the footprints preserved in the desert ash on the Big Island in this beautiful open camping site. Malta’s City of Rocks has 64 campsites of varying elevation, perfect for hiking and exploring. Located in Utica, Illinois, Starved Rock is the perfect place to hike and see majestic waterfalls. Enjoy this Remington, Indiana campground with fun summer activities for the kiddos! Camp in a yurt! You’ll love cabin/tent hybrids in Clear Lake, Iowa, one of the Midwest’s best kept secrets. Experience Native American history in this picturesque registered historical site in Kansas. Camp near the site of Kentucky’s last battle of the Revolutionary War and experience history. Gorgeous sunsets and beach walks make this a romantic camping spot for couples. Lakes and hunting close to Canada make this private campground in Maine a wonderful place for families. Have you ever thought of camping in a treehouse? Check it out in Rohrersville, Maryland! Explore New England history in Boston Harbor. With a close drive to the city, you can extend your camping trip to visit some famous Boston landmarks! This quiet island park is a great place to camp with your family. For extra fun, check out ghost towns and the wagon tours! Check out the historic lighthouse, go fishing, and take a hike in this state park on Lake Superior’s North shore. This quiet, small campground has 21 campsites and lake access along with fantastic hiking trails. Enjoy a pleasant camping trip on this public campground site in Swan River State Forest Park. The beautiful Niobrara River provides a backdrop for this park which offers amenities and events throughout camping season. Former volcanic activity made this park a famed picturesque camping site for your family to enjoy. Camp, visit Echo Lake Beach, Cannon Mountain, and enjoy the scenery from the aerial tramway. If farming appeals to your family, this is the place to take your New Jersey camping trip. Milk a cow, ride a horse, and learn about farming. Wildflowers and wildlife are in abundance at this gorgeous state park in New Mexico. This six million acre protected area is a must-see in upstate New York. There are hundreds of campgrounds available for all interests and levels. This site is a camper’s dream come true with waterfalls, trails, horseback riding, boating, and more! True to its name, you’ll find a loop of different campsites. Enjoy everything here from from sunsets to campfires. As a major bird migration route, this campground is a thrill for aviary enthusiasts. Boasting stunning scenery, this spectacular camping spot is located in the San Bois Mountains and will not disappoint! A coastal gem, this State Park offers everything from hiking to fishing. Much of it is accessible to those with physical disabilities. Located in the Pocono Mountains of Pennsylvania, this lake is your destination for your next camping vacation! Escape to nature in the spacious and secluded campsites of Bowdish lake. Facilities for season-long camping are available. This State Park overlooks the lake and is still close to the city. Boating, fishing, and hiking are just some of the activities offered. Named after President Andrew Jackson because of his tough, aggressive personality, this campground is the place for spirited individuals ready to take on nature. Visit this campsite to see one of the largest live oak trees in Texas! Explore the heart of Arches National Park while taking adventures on hiking trails and admiring different species of cacti. Here you will enjoy gorgeous sunsets, hiking trails, hanging out at the beach, or just the lush natural surroundings. With four primitive campgrounds without vehicle access to showers and bathhouses, this campsite gives you a chance to really rough it in the wild. Stay in a real wood and canvas teepee in this unique campsite in Washington State. This Mountain Lake Campground is great for swimming or scuba diving. Fishing is plentiful as it’s stocked with trout in the spring and the fall. View some of the state’s preserved wilderness. Wake up to the sounds of waves outside of your tent, and fall asleep under the sunset on the beach. Check out this list of Things To Do in Wisconsin, too! Catch rainbow trout, perch and walleye from the Boysen Reservoir in this fisherman’s paradise. A quick tip on for finding a great campsite outside of the ones listed. Whether you’re looking for tent or RV camping, state campgrounds and county campgrounds offer nice campsites at a reasonable price. If you’re looking for some other great camping related posts be sure to read about choosing Tent or RV camping, what to bring for your dog, and setting up a camping first aid kit. If you want to celebrate while camping or at home, try a camping tropical punch, s’mores latte, camping themed accessories, and a camping themed birthday. I hope you were able to find an awesome campsites with these amazing options across the country! Did I miss a campground? Or is there another one that’s a close second? Let me know where you think the best places to camp are in the comments! 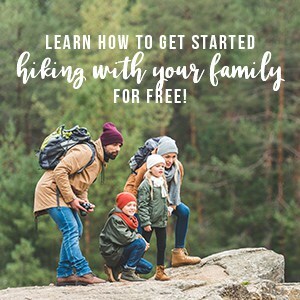 Don’t miss this easy camping food for your next trip! What a great list! We’re headed out to Sequoia National Park on Monday! Have an amazing time, Camille! Born and bred Alaskan and the cabins at Charley River are great but… Denali is still IT. And yes, you can camp on the fringes for free. We love to camp at Fort De Soto here in FL. I’ve never heard of that NJ farm! What an awesome list! I’m not much of a camper, but I know a few people who would love this list! We’re doing a camping roadtrip through WA, OR and CA this summer, so I definitely need to scope out these campgrounds! Thank you! That sounds like so much fun, Chelsea! I hope you have an AWESOME time! For Nevada I love Valley of Fire! Thanks for the suggestion, Stephanie! What a great list! We’re have been trying to think of a great place to camp once baby #3 is here. I totally need to check these out. Thanks, Lynzy! Camping is so fun with little ones! Oh thank you! I pinned this immediately! What a great list! We camp a lot out here (California) and absolutely love Bodega Bay for camping! Thanks, Lisa! I’d love to visit Bodega Bay sometime! This is a great list. We just moved to Ohio and I was looking for places to camp, Indian Lake State Park is only an hour away from us. We’ll be checking it out soon! Thank you so much, Nina! I hope you’re able to make it there soon! Hunting Island State Park in SC I see a favorite of ours. Thanks for the list … can’t wait to try some of the places on this list that are RV friendly. We live in Texas and have been to Goose Island. Although we did like it, it didn’t make our favorite list as there were too many mosquitos when we were there!